Slay the Spire is a surprise, smash hit indie game: more than one million copies sold in its first year, Steam top ten best-selling game in January 2018, and praised by gaming publications such as Polygon, PC Gamer, and Rock, Paper, Shotgun. I designed and painted the promotional art, title screen, level backgrounds, and environment assets for Slay the Spire. With the aid of very rough concept prompts, to a large degree I established the look and feel of the game. As with a lot of my art, weirdness was a goal for the visuals in this project. As an indie game, we were in good position to avoid timidity, take intelligent risks, and find a good balance between what's 'comprehensible' and what's 'fresh' in the visuals needed for the game. 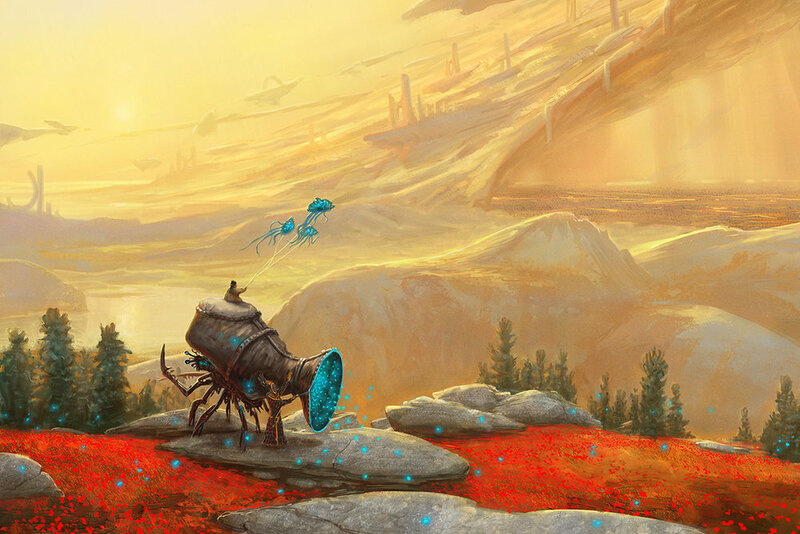 Numenera is Earth, a billion years in the future. Civilizations and have risen and fallen nine times, leaving the world a MUCH weirder place. It is the setting for a tabletop RPG created by Monte Cook Games, as well as the highly-rated CRPG, 'Torment: Tides of Numenera'. I was brought in to create a series of fresh environment visuals to promote MCG's Numenera 2 Kickstarter campaign in the fall of 2017. MCG gave me carte blanche to develop epic, weird environment concepts (almost all approved) and then bring them to full illustrative glory. The campaign raised an incredible $845,000+ from its backers. The revamped RPG core books allowed me to contribute quite a bit of art to the setting. I can't express how much fun I've had with the unique, weird feel of this project.